The year was 1965. The world’s first commercial communications satellite, nicknamed The Early Bird, was placed in orbit. The Today Show aired its first totally color broadcast and the Ford Mustang was the car to have. James Bond was saving the country in the movie Gold Finger and Valley Valve and Pipe Supply began filling the needs of water supply professionals. While much has changed since then, a few things have remained constant. We’re still a family owned and operated business. We still believe there’s no substitute for personal service and customer satisfaction, and we’re still filling the needs of commercial customers. 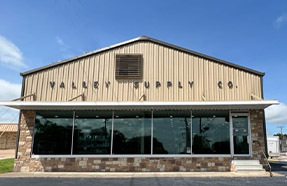 Valley Valve and Pipe Supply continues to offer our customers the value they expect with competitive pricing while maintaining a level of service that has kept them coming back for nearly a half century. There’s a knowledge that comes with experience that simply can’t be taught. The staff of Valley Valve and Pipe Supply has over 80 years of combined experience in the plumbing supply industry. We’ve witnessed a multitude of changes, from new products to new twists on old products. We’ve learned how to tell the difference between hype and performance and we know what equipment works … and what you should avoid. We save you time and money by helping you make the right choices while avoiding the wrong ones. You get everything you expect and more from Valley Valve and Pipe Supply.